Amy Swartz is a Toronto-based visual artist. She creates highly detailed and meticulously crafted collections that combine both natural and artificial materials in sculpture/installation. Her work explores the idea of obsession, not only in the practice of art, but also in humanity’s perceived control over nature, life, and death. 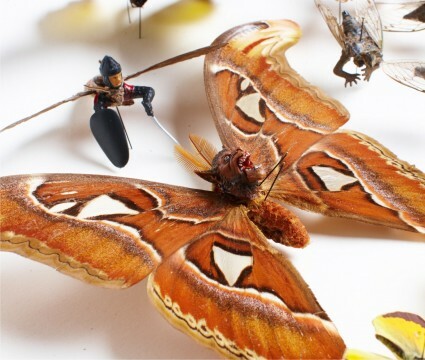 In the exhibition Pest, Swartz display’s, in museum style vitrines, her extraordinarily beautiful, creepy compulsion of some 2,500 insects that she has meticulously fused, Moreau-like, with tiny human toy miniatures, to create sweeping epics of ornithological delirium. These 3D collages present humorous scenarios of insects carrying out human interactions from history and fiction. Swartz has received many accolades/awards, critical acclaim for her unique and relatively rare art form as well several OAC Creation Grants. Join us for a Gala Opening Reception at Definitely Superior Art Gallery Sat. Mar.29 @7-10pm with 3 new exhibitions, part of the downtown wide Urban Infill exhibitions and a ferocity of Art/Music/Dance/Wearable Art/ Performances/Artist talks. Catering by Sweet Pea’s Home Catering and Restaurant. Pick up your map at DefSup and follow the Tour Guides to the exciting Urban Infill locations, re-discover your Downtown Waterfront District through art & culture. Gallery 1.